Cost: $5 per child participating. Deadline: Deadline for payment, cancellation, and refund is November 27th. No refunds will be issued after November 27th. Space is limited, so please RSVP (info below) as soon as you can. Your payment reserves your spot. Details: If you have a LEGO lover in your home, then this is the Holiday party for you! 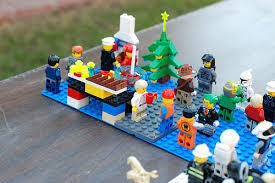 The kids will have the opportunity to share their love of LEGOs with their fellow LEGO enthusiasts. Have your LEGO nuts build an original LEGO creation. Whatever they are inspired to build will be great. We will have tables set up to display their creations and everyone will have the opportunity to come up front and share a little about their work. Please bring a finger food to share (any food that does not require utensils to eat) and your own drinks. Plates and napkins will be provided. Every child who participates will receive a LEGO gift wrapped up ready to tear open and enjoy. There will be a couple of LEGO games set up to play as well. So, if your kids enjoy LEGOs, then do join us for a great time!